Andreas Gursky. 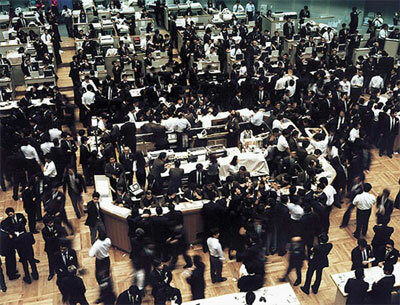 Tokyo Stock Exchange. 1990. Sitting in a clichéd “American” restaurant I notice an older employee, late 40′s, as he gently brushes the vegetables from the salad arrangement that have gone askew into a small plastic tub for disposal. The hotshot twenty-something comes with his blonde-streaked hair gelled into interesting spikes upon his head. “Hey! My name’s Mark, and I’l be your server tonight. So what are you ladies having?” he asks with a huge grin on his clean shaven face. I’m too busy watching Mr. Salad Bar to notice. “I’ll have the Great American Cheeseburger, and my friend will have a steak with a side of mashed potatoes.” my friend replies politely. I snap out of my momentary daze. “Uhh, just a water please.” My friend asks for the same. The waiter quickly whisks up our menus and flashes us another I-just-started-using-those-Crest-Whitestripes-and-they’ve-been-working great smile. I can almost see the pocket where he keeps his tips in. “Do you think he has a wife, or kids?” I ask my friend wistfully, as I resume my people watching. She turns around and slides down the red pleather booth for a better look. A woman dressed in a crisp pant suit grabs one of the small porcelain plates and attempts to be as graceful as possible as she uses the tongs to transport the broccoli onto her plate. The salad man hurriedly shifts to the other end of the bar, as not to be in the woman’s way. “Wow, and you can tell this just by looking at the dude? I think you and Ms. Cleo need to get together,” my friend, thick with sarcasm and pop culture references, says. Now we’re both staring straight at him, trying to be as inconspicuous as possible, but failing miserably. The Salad Bar man replenishes the supply of those delicious little cherry tomatoes and gives the ranch dressing a stir. The waiter comes with our food; we eat and it’s a lovely meal, la de da. As we leave, I give Mr. Salad Bar a big smile. And after a slightly confused face, I get a sheepish one back. And then it’s on to the cubed ham. First published in Facsimile Magazine in March 2007. Written approximately late 2006, perhaps earlier. Reposted on frisbeejackson.com 2/14/08 with slight revisions.